By this deed of renunciation, a tenant or prospective tenant can renounce his right to a new commercial lease on expiry of the present term. This follows the law set out in the Landlord and Tenant Act 1980 and section 47 of The Civil Law (Miscellaneous Provisions) Act, 2008. Once in place, the landlord can be sure to be able to obtain vacant possession when the term of the lease expires. 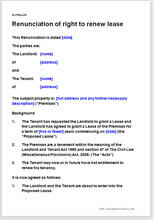 The law requires that the tenant shall have taken legal advice. However, we suggest that the landlord has no way of knowing whether or not the tenant has complied. The landlord must therefore rely on the assertion by the tenant that he has done so. We have provided for that assertion. If the tenant had not, in fact, taken legal advice, The renunciation would be invalid. However, we doubt that the Court would order in favour of a tenant who was in breach of this deed. "Excellent documents and so easy to use "